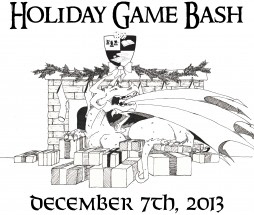 This Saturday past was Holiday Game Bash VIII, a big get-together or a small convention, run by North Coast Gamers. +Tom K and I spent the day celebrating that we could be heroes with +Jerry Teleha and a nice assortment of new people. Tom and I headed over to the Rock City Music Hall a little after eleven in the morning. We were looking forward to checking out the games and spending time with Jerry, but not all that optimistic about our own events because we were running RPGs and, last time, this seemed to be mostly a board game crowd. We were greeted inside by smiling hosts and a board with the "tour of games" logos on it. They've really got a great venue. The one we went to a couple of years ago was in a church and I ended up in a Sunday school room with tables and chairs that were made for toddlers. 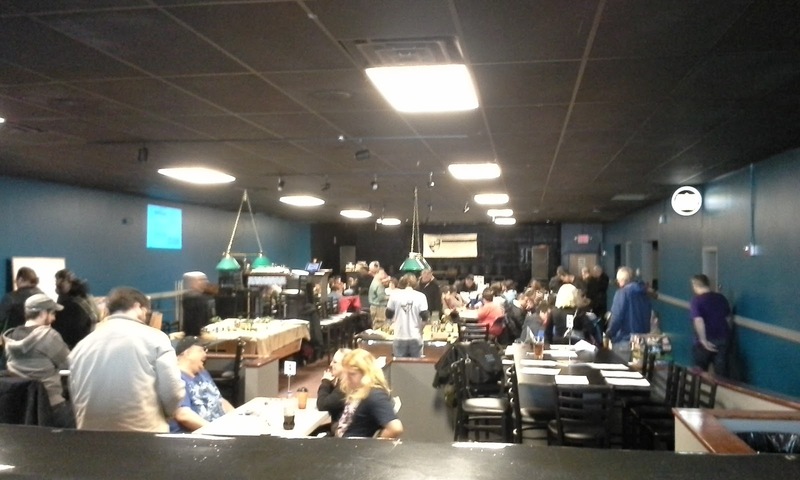 This time it was a big open hall with plenty of grown-up size tables and a restaurant/bar in the next room. We signed in, found Jerry, grabbed some drinks, and looked up our table numbers. 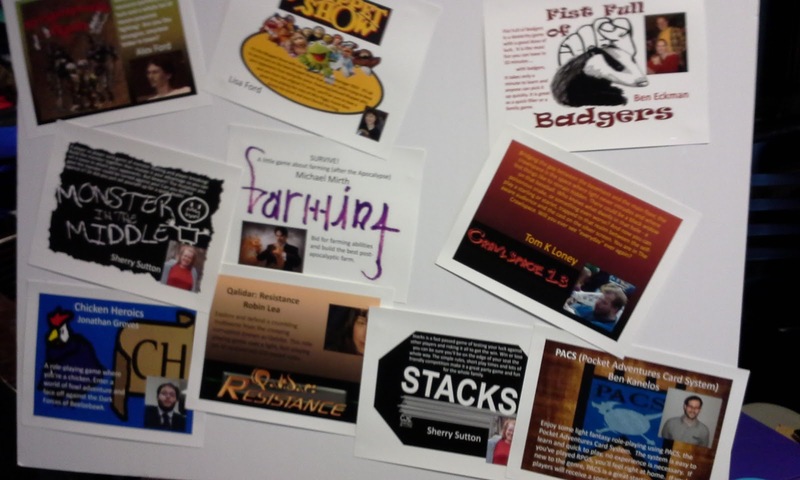 The role-playing games were in kind of a nook at the front of the hall. Tom's game was first up on my list. 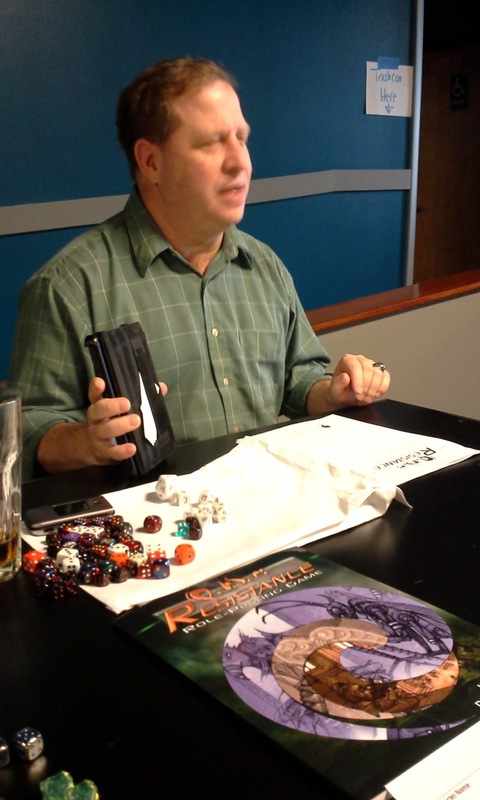 He was running a Qalidar adventure called "Corporate Raiders" and I was helping him out with the rules because, even though they're waaay on the light side, he's d20-challenged. We sat around the table for a while and were starting to think it would be a wash, but then Tom spotted an acquaintance wandering by and snagged him. "Corporate Raiders" was set up so that we started out as almost-retirees with no levels in any class. I based mine on Mallory Archer and John created an engineer named Wayne. I don't want to give too many spoilers, but we did eventually get to make our characters more adventure-y, which helped us survive in a world gone mad with Tom's pyramid-headed raiders and shiny glam warriors. Not exactly the kind of opponents I would have come up with, but it was fun for me to see Tom (or anyone) making his own thing out of my game. We found Jerry at the bar and had a late lunch. The specials they had for the Game Bash were good and actually quite a bit cheaper than the regular menu. Jerry took off first for a game he was in. Tom & I followed after another round to set up for mine. We were still fairly early, but there was nobody using the table before me, so we camped out. A guy came over and introduced himself. I think his name was Ben but, for reasons that will make more sense later, my brain insists on labeling him "Sherman Peabody." The scenario was basically the same one I ran at Gen Con this year. As always, I tinkered with it a bit while we played. This time I left a little bit more a mystery to solve and threw in a bunch of machine-munching antroids. Jerry showed up about a third of the way on and we worked him in. He had a particular grudge against giant ant-like creatures from a bad Tunnels & Trolls experience. I don't know about them, but I had fun, and was especially gratified by their reaction to the "peel." And that's pretty much it. They were closing the place up when we left for a late night snack with Jerry.